A few months ago, we published an article on several ways to get potential clients to try your firm for the first time… to “take a chance” with you on that very first project. But the fact is… you cannot build a company on first-time clients. To grow a sustainable, successful firm, you need repeat clientele – those firms that come back to you again and again. And turning first-time clients into repeat clients is an integral part of the marketing & sales process. Think of it this way… a first-time client isn’t really a “buy-er,” they’re a “try-er” – doing their homework to see if you can do what your website and capabilities presentation said you can do… to see if you’re easy to work with… to assess the skills and professionalism of your project personnel. Bottom line… to see if you’re the kind of vendor with whom they can build a long-term relationship. Establish the role of Key Account Manager. While your PDs and PMs handle all the aspects of projects, the KAM is responsible for maintaining and expanding your “relationship” with their assigned clients – your biggest & best clients. They are the go-to person when issues pop up. They are an advocate for their clients inside your office. They visit, educate and entertain your clients. They up-sell and cross-sell. I have yet to talk to a client who hasn’t said that they have a handful of clients that account for the majority of their business. If that describes you, then you have to ask, “What am I doing to ensure that my largest clients STAY my largest clients?” Having someone focused on the “relationship” is a great start. Conduct post-project surveys. I am continually amazed at the number of firms in the research industry that don’t do research on themselves. [I guess it’s like a chef who doesn’t want to cook when he or she gets home from the restaurant!]. Conducting surveys provides two different kinds of opportunities. The first is to get better operationally… to get feedback on what you’re doing and how to do it better. The second – and just as important – is to reinforce your relationships with your clients. If the survey invitation is personalized, if the response is acknowledged, if you pick up the phone and call your client if any aspect of the project was reported as sub-par and if you actually act on their suggestions… you are reinforcing your position as a responsive and reliable supplier. Maintain a strong marketing & communications effort. The things you’re doing to build awareness and position your firm in the marketplace to find your first-time clients – email, social media, blogging, content creation, advertising, etc. – also help to keep your firm top-of-mind and continually reinforce your position with existing clients, too. So keep it up… because as soon as you stop, your competitors will come in behind you and usurp your position. Surprise your clients. While you can’t do this for all clients, it’s worth the investment for your largest ones. For example… show up unexpectedly with bagels for their morning meeting; when you’re in their town, make sure to take them to dinner; send them tickets to a show or sporting event you know will interest them; in addition to your standard Christmas gifts, get your key contacts something special; etc. By the way, surprising clients should be part of the role of the Key Account Manager (see #1 above). I know it sounds trite… but send Thank You notes. Handwritten… not emails. Make them personalized and genuine (because if you aren’t genuinely grateful for their business – you will lose it!). Create high-quality stationary with your firm’s logo on it. You can send notes when a proposal is accepted, when a project is completed, when a client reaches a certain level of business, etc. It doesn’t really matter why you send them – just send them! [This one is especially for senior executives.] TALK to your clients. Really get to know them… executive-to-executive. Let them know that you’re involved in their business and will make sure your staff takes care of them. Let them know they can call you anytime and for any reason. Ask questions like: “How are we doing?”, “What do we do right?”, “What do we do wrong?”, “How can we get better?” Listen to them… then take action. Want to make a big splash? Give them your cell number (I can hear the gasps now!). To get started, why not set a goal of calling just one client each week? And it doesn’t really matter who you call… but reach out and connect. The more you learn from your clients, the better supplier you will become. Think about giving discounts. While a long-term relationship is rarely based on price, it is a tangible reward for loyalty – a reward that does have a positive impact on your clients. If you’re going to do this, consider a tiered volume discounts – the more business they bring to you in a given time period, the deeper the discount. With that plan, both parties win. 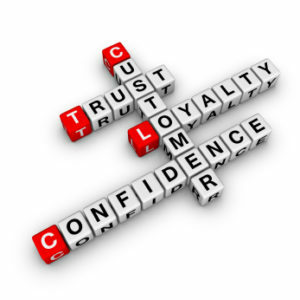 Lastly, a client’s loyalty is not just about the projects themselves… it’s about the entire “customer experience.” While a project might go really well, if the rest of the experience surrounding it (interaction with PMs, billing accuracy, accessibility/responsiveness of your team, final reporting, etc.) is not great, that client is probably not coming back. So take a look at every client touch point over the entire life of a project and make sure you’re buttoned-up. That is, make sure you’ve got the right people and the right processes in place. Takeaway: In your marketing and sales plan… you must allocate your resources (time, ideas and money) for two distinct purposes – 1) to find and secure new clients and 2) to ensure that existing clients come back to you again and again. Do that, and you’ll have a plan on which to build a long-term, successful business… and a strong competitive advantage.